When I was in college, a roommate started calling me her lobster, based jokingly on the scene from Friends where Phoebe explains about Rachel being Ross's lobster. She explains that lobsters stick together for life (which isn't actually true), but it's an iconic scene anyway that helps explain the relationship between the two. The phrase stuck, and I began collecting lobster (and crab) things, and it's sort of become a part of my story. <3 There's a follow up scene later in the episode too where Rachel starts to realize that Ross was always meant for her. I have everything from cookie cutters, pajama pants, socks, stuffed toys to bottle openers, dishes, bags, swim trunks, t-shirts, rings, birthday cards, etc... We've even had a couple pet "lobsters" which are actually orange and electric blue crayfish (fittingly!). The electric blue crayfish are native to the Florida Everglades and live in freshwater, so they can adjust right into our fish tank. I didn’t get a chance to get any “good” pictures with my big camera, but I have a couple pretty good ones from Aaron’s iPhone that are posted below. 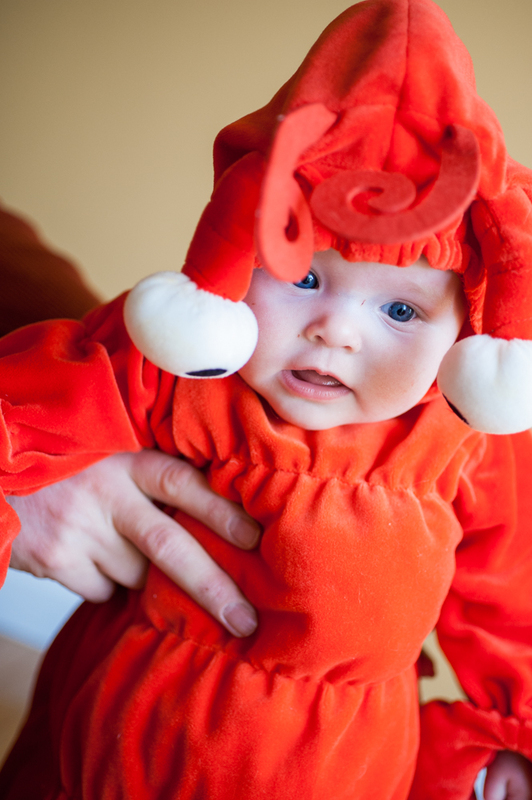 You'll also see some photos of my two kiddos dressed up as lobsters -- Maximus for Halloween 2010 and Hadley when we decided she wouldn't fit in it by the following Halloween so we dressed her up before we sold it. We also have a pretty good assortment of crab-themed items at our house, and especially baby clothes because Carter’s Co. seems to love crabs as much as we love lobsters! Take a peek at my collection! So there you have it -- my obsession with lobsters! Now how did the logo come about? (The images in this post were collaged before I re-branded.) I don't remember the exact minute I figured it out, but I definitely had an "aha!" moment when I realized clearly that the lobster was so important to me and my personality that it needed to be a part of my brand. I also had dismissed the color orange for so long too even though it was so very personal to me and my personality, and tied in so strongly with my affinity to color and the lobster image itself. I've also never felt strongly that whimsical curly fonts fit my brand either, so I opted to go with a blocky, more san serif font that I'd seen used in some drink advertising. With the addition of an arced line of type and a few dot embellishments, the newest HBP logo was born!